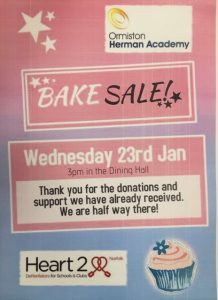 Ormiston Herman Academy – Second Heart 2 Heart Defibrillator Fundraiser! Ormiston Herman Academy > News > Academy news > Second Heart 2 Heart Defibrillator Fundraiser! Second Heart 2 Heart Defibrillator Fundraiser! Please see the attached flyer for details of the second Heart 2 Heart Bake Sale that a wonderful group of parents have organised in order to fund a defibrillator for the Academy. We are already half way to our target due to the support you have given us!